During late July one year, I recall walking the beach of the Oyster River estuary on Vancouver Island with high hopes of fly fishing for pink salmon. I can still see the dozen or more fly fishers together in their gloom. They were sitting all in a row on one of the beach logs wistfully watching a glassy calm Strait of Georgia for a flashy locator pink salmon. But, sadly, none were to be seen on that day. The previous year, the pinks had arrived on July 29th, a date I have underlined in my diary because the fishing was outstanding. It was however, only a few days before the pink salmon did arrive that year and they were to provide a phenomenal sports fishery along the east coast of Vancouver Island. In recent years, in many coastal estuaries and beach areas these powerful one, two and three kilo salmon have attracted an ever increasing following of fly fishermen. They have discovered the incredible fighting abilities of these scrappy salmon when hooked on a small streamer fly! Thanks to effort by the Department of Fisheries & Oceans, in the past five years pink salmon have become available all along the east coast of Vancouver Island and in many other coastal areas. Some schools travel and concentrate along the beaches within meters of the shore and, it is at these beach areas that the fly anglers congregate. There is no doubt that this pink salmon beach fly fishery in British Columbia can truly be called the salmon fly fishery of the 90's. With the marked interest in fly fishing, another phenomenon of the 90's, I have watched many novice fly fishers hook their first 'big' fish while fishing for pink salmon. For reasons know only to the fish, pink salmon will actively take a slow stripped pink colored fly. 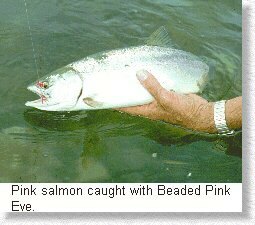 Yes, on the beach I have seen some anglers fish light lures effectively and some even successfully for pink salmon, but, I have yet to see a lure that will match the effectiveness of a slow retrieved pink fly. Pinks are powerful fighters and I would recommend that you always play these fish from the reel. When a pink takes the fly it is a soft strike, barely discernible at times but, always noticeable if you are slowly stripping the fly line over your sensitive index finger. 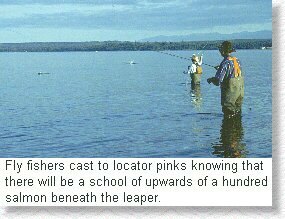 Lift the rod tip at the strike and the pink will set the hook itself as it turns to follow and remain with the school. Like whitefish or grayling, pinks have soft mouths with the result that a power strike can tear out the hook. Once hooked, pink salmon like to run! Let them! This is the time to have the fish take out the slack that may have accumulated on your retrieve and for you to, 'get it to the reel', as the expression goes. Once at the reel, the fish can be fought with the arc of the rod and the angler reeling in line as the fish tires. Beach fishing for pinks is shallow water fishing. Be prepared for powerful fish who provide a long and dogged fight. I prefer a short three meter sink tip fly line or a dry line. When I start hooking 'rock-hugging' bullheads or sculpins I know I am fishing too deep. Leader length should accommodate the often clear saltwater and be at least three meters of 8 pound test. 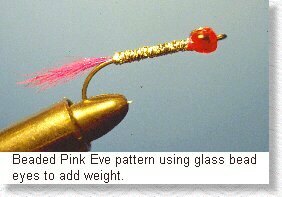 The Pink Eve pattern with all it's variations is the most effective fly for pink salmon in estuary regions. For those fly fishers who would try this exciting sports fishery, I would recommend the following equipment; a number seven fly rod of from nine to ten feet in length; a sink tip fly line with the sink tip being of from five to ten feet, or, a dry line with a slightly weighted fly; a long leader, from nine to twelve feet depending upon how clear the water is: "the clearer the water the longer the leader"; small pink and silver flies like the Pink Eve, in long shank sizes of from #6 to #2; and, a quality fly reel which is salt resistant. I would also recommend chest waders but, do not wade too deep for this will spook the pinks from the shallow shore waters. Fly colors for Pacific salmon fly fishing follow this basic rule, silver for coho (silvers) and chinook (springs, kings), red for sockeye, and pink for pinks. Well I remember one occasion some years ago following this color rule: as organized sportsmen we were trying to convince Federal Fisheries that these salmon should be fishable by sports anglers while in fresh water particularly with the massive increase of these salmon by the Salmonid Enhancement Program (S.E.P.). Dr. Peter Pearce, Commissioner on Pacific Fisheries Policy was conducting a hearing at that time and being a fly fisherman he wanted convincing that they were a potential sports fish. It was early August and a number of pinks were schooling at the estuary of the Keogh River. Unfortunately I had left my tackle at home as it was a meeting but, I was able to borrow some fly rods with sink tip lines. No suitable flies were available so I purchased some silver hooks, some pink floss and a spool of pink thread. At the meeting I hand tied, without a vice, a half dozen flies and then, after the meeting we took Dr. Pearce to the estuary beaches of the Keogh. After only a few casts he hooked his first fish, and then another, and another. It was catch and release as Dr. Pearce had a plane to catch but, in that hour of fishing he landed six powerful salmon. Unfortunately, even with his supportative recommendation, Federal Fisheries has still only tinkered with openings for this immense freshwater sports fishery. For those anglers fly fishing from boats in open waters, pink salmon tend to travel near the surface. If you can get your boat to drift in front of a school of fish, they can also be hooked casting to the front of the school in open waters far from the shore. Two races of pink salmon occur in B.C. coastal waters. These two races are recognized by the fact that they spawn either in odd numbered years or even numbered years. 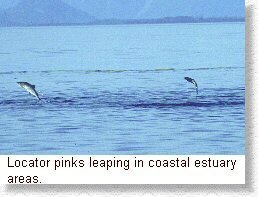 Pinks are the most evolved of all Pacific salmon and have only a short two year life cycle. Work by DFO to increase even numbered year races in many once barren streams has resulted in the huge upsurging of angling interest in these fish. Now, it is possible to find pinks from April through August in most coastal waters every year. August is the premier month for pink salmon beach fishing as these fish are concentrated in moving schools in all estuary areas fortunate to have these classic sporting salmon. 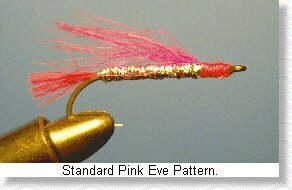 Now is the time for the pink salmon fly fisher!